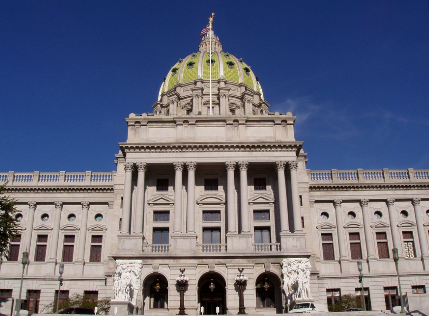 The state Supreme Court ruled that if the legislature and Governor Tom Wolf could not agree on a new Congressional map for the state ahead of today, they would redraw the maps but allow others to submit maps and comments for their consideration. The state House Democrats have already taken the court up on this offer, submitting their prefered map that was created just by the caucus. “There has been no plan from the General Assembly as a whole,” state House Democratic spokesman Bill Patton told the Inquirer. 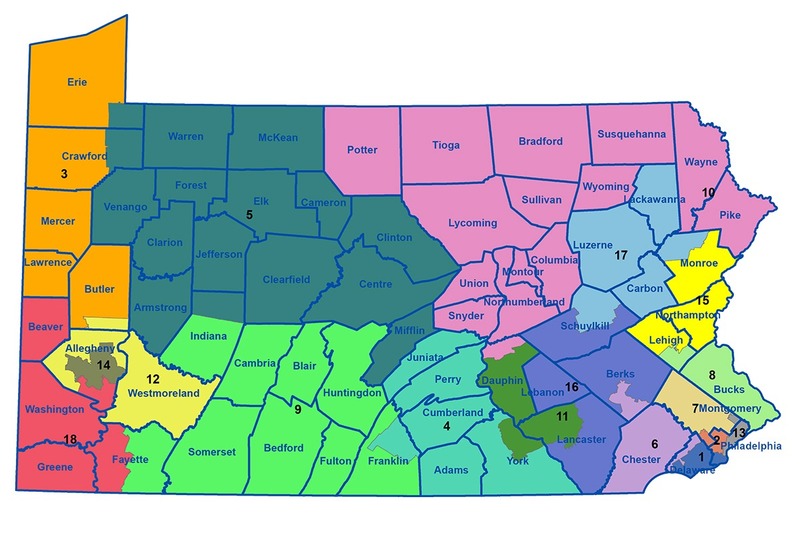 The map splits more counties and towns than the Republican map submitted to Wolf last week. The Republican plan split 15 counties and 17 towns, while the House Democratic plan splits 17 counties and 18 towns. 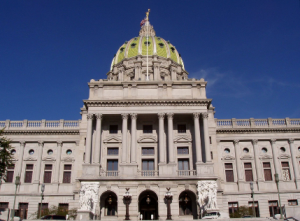 PoliticsPA has reached out to state Senate and House Republicans for comment on the map. You can view the map below. Update: State Senate Democrats submitted a map of their own to the Supreme Court. Their map splits less counties than both the GOP and House Democratic maps, splitting only 11 counties, and matches the GOP’s plan with 17 split towns. Update: Late Thursday night, Governor Tom Wolf submitted his own map to the Supreme Court, allowing little time for analysis. His map would pit two incumbents, Congressmen Mike Kelly and Glenn Thompson against each other for the newly drawn 5th district. Why does Lawrence Tabas think he has the right to submit a map? He’s not a person elected by the people who is sitting in the PA legislature. A lawyer for a firm fighting the situation is not an elected representative sitting in the PA legislature. In fact, no one, no body—other than the legislature has the constitutional authority to draw congressional lines. The fact that Tabas doesn’t know that… his actions of submitting a map goes completely counter to the legal argument that no one but the legislature can draw lines. Amanda Holt submitted her own maps in the 2011 Legislative Reapportionment litigation which the Supreme Court utilized as a basis for overruling the first set of maps approved by the LRC. Yes, Mr. Tabas has a right to submit a timely Amicus Curiae brief in this litigation as does any other Pennsylvania voter. See PA Rule of Appellate Procedure 531. Whether the Supreme Court affords what Mr. Tabas has filed any weight is another matter. It’s absolutely ridiculous to say that King Scarnati and Wannabe Gov Turzai will successfully challenge a Pa Supreme Court redraw decision when the US Supreme Court has already decided to not hear their original appeal. The fact is that the Pa Supreme Court has been forced into this redraw by petty partisan politics advocated by Scarnati/Turzai and has better things to do but, in the name of good government, has to intervene on behalf of the citizens of Pa. Scarnati/Turzai will not prevail in a challenge because it is obvious that the US Supreme Court feels changes need to be made or they would have heard the Republican appeal. The wise move would be for all parties to allow the PA Supreme Court decision to be final and stop playing partisan politics with redistricting. We need an independent commission asap to do redistricting to ensure fundamental fairness for the sanctity of the vote. The Turzai/Scarnati redraw actually followed the PA Supreme Court’s instructions more closely than these Dem maps do, but that wasn’t the point. Wolf and the Dems knew there is no way the Court signs off on their maps (and if they do, it gives the GOP a helluva argument for SCOTUS). The Dems are just trying to leverage the best map possible out of the PA Supreme Court, which is probably going to be something in-between Turzai/Scarnati and what they submitted. I still think this thing is a long way from being over. The GOP will try to protest whatever comes out of the PA Supreme Court to SCOTUS, and depending on the map, they just may succeed. I understand why Wolf vetoed the GOP redraw (which handed Dems the 7th and gave them a good shot in two other districts), but if the Republican challenge is successful, we’ll be holding our congressional elections this year under the 2011 lines. Maybe Republicans will shock everyone and accept what the PA Surpremes ultimately decide, but I doubt it. The 3rd district map is really hard to formulate because Erie really shares more in common with fellow Lake Erie border counties in Ohio and New York than Western PA. Wolf did a decent job by linking it with border counties and Warren county but I understand the argument that Lawrence and Beaver share different interests than Erie. While true, Erie also shares different interests than Venango and Forest. Hard to come up with something fair in that corner but I think Wolf got pretty close. Only part to figure out is whether to incorporate Warren or Butler. Mr. Diano, I would hate to inform you that when the last Republican Mayor left office in 1952. The US population was 175 million. The city had 6 US House Seats Its population was 2 million people. After 67 years of Democratic Party rule the US population is 320 million, Philadelphia has 3 congressional seats and our population is 1.56 million. Obviously, not everyone wants to live here in the birth place of liberty since almost 500,000 have left. I know many people would gladly evacuate to West F*cksberg if they could get enough money for their houses to escape from this nightmare the Philadelphia Democratic Machine constructed for us. Divide by 18 districts, you get 710 thousand per district. Philly Pop is: 1.56 million. That’s two full districts (that do not extend outside of Philly, and 1 district that shares 140,000 (out of 710,000) with Philly. So, all of 1st and 2nd in Philly. Montco and Bucks have populations: 819,264 and 627,367 respectively. Bucks becomes all one district, and that district pulls 80,000 voters from Montco. The rest of Montco is all one district except for about 25,000 that goes into Chester or Berks. (Berks has the shortest border, so maybe spill into Berks). All of Bucks is in one district (that spills a bit into Montco). All of Delco is in one district (that spills a bit into Philly). One district is entirely in Montco, with two small parts shared fairly naturally with Bucks and Berks. My point is you have to start with the SE and work the high population counties. Congress represents more than just registered voters. Do we even know how many people actually live in these congressional districts? Glad the next census is two years away…. I believe the congressional districts are allocated by total population, not by number of registered voters. This should be done by neutral parties with a team of data analytics specialists. I do not mind the parties having the right to comment, but we all know who we live near and who is part of our community. No one should be talking about whose seat is “saved” or “lost” or “at risk”… it is NOT THEIR SEAT. Every seat is ours, the voters. We should look at these maps and say, “Does this represent my community? Am I in a district that makes sense to me? Will a representative from this district be able to speak to my needs, or am I in a district with other communities that have drastically different needs?” Those are the questions that we, the voters, need to ask ourselves to determine if the maps are fair. My objection to the current districts is that I do not vote with my neighbors. My school district is part of 2 different congressional districts! My kids’ elementary school is not in the district where I vote… that makes no sense. Instead, I vote with people in a much more urban environment that has very different needs. My community is not represented by our representatives. This is about equal representation for all Pennsylvanians. We elect people to play politics, right now we need to have our own backs. I will volunteer to be the neutral benevolent dictator you are secretly longing for. Are you kidding me — are you really that naïve to believe there is a neutral party elected by the people? That is why our founding fathers gave us divided government to offset competing interests. Colossal waste of time. The only legal options are 1) the current maps or 2) the map submitted by legislative leadership, but only if the legislature approves it. SCOTUS will slap down anything the PASC attempts to impose. If that helps you feel better, bless you. We’ll soon see, won’t we? BTW, I (slightly) misrepresented #2: Any of the maps would be legal, but only if the PA legislature approves it. Which ones do you think a Republican-controlled legislature are more likely to approve? Another wrong assertion from Crackerjack University. Read Arizona Legislature v. Arizona Independent Redistricting Commission. Justice Ruth Bader Ginsburg delivered the opinion for the 5-4 majority. The Court held that the Elections Clause of the federal Constitution did not preclude an independent commission, created by initiative, from creating the map for congressional districts. Although the Elections Clause specifically mentions the state legislature, at the time the federal Constitution was ratified, direct lawmaking by the people did not occur. Since then, state Constitutions have been ratified that specifically place lawmaking power in the hands of the electorate in the form of an initiative, as the Arizona State Constitution did. The key words therein are “created by [voter] initiative.” Assume, then, that, in PA’s case, the court’s imposition of maps will be struck down, post haste. So, if your self-assumed, albeit unearned superiority comforts you, that will put you in company with just about every liberal who walks the earth. Looks like the Wolf map protects Doyle in 14, he needs it. Western Democratic infrastructure crumbled the last 25 years and he has the balls to tell people he Fitz and Costa are the power in the West. DEM Socialists need to Target this guy, not just the Costas. Mike likes the percs but doesnt like the work. Since the State Supreme Court is not non-partisan Judges ,but partisan legislators.The legislators need to impeach them. The State Constitution and the law give the legislators the authority to draw congressional maps. And you take notice that everyone but the majority legislators are going to have a say in drawing the maps. Wow, the Senate Democratic one really attempts to swing things around. They take Glenn Thompson out of Centre county and basically send him into what was Shuster’s area. Then it appears they are attempting to recreate a district that a Murtha Democrat out of Johnstown could win. The House Democrats one is a little more believable at first glance, but the Senate one is a very extreme change that fails the smell test worse than the Scarnati map – and I’m a Democrat. It is indeed, gerrymandered to favor Democrats. Remember, Congressional Districts are supposed to be drawn by balancing the shaped Physical Geography, Total Population, and Population Geography of a State. I said it before, and I’ll say it again; Philadelphia County needs to be busted up into it’s own 2 Congressional Districts, with remaining 73,000 people put into another. The Democrat Map pictured above, basically gives Philadelphia even more control over more PA Com Districts. It is GERRYMANDERED TO FAVOR DEMOCRATS, particularly by giving Philadelphia more control over more Districts. Agree – a gerrymander is a gerrymander regardless of who benefits. Have to wonder what the court is going to eventually come up with – and will anyone be satisfied? No one will, but Democrats in truth, will be the least satisfied, and most angry. If PA’s Congressional Districts are drawn fairly (like I said, a good starting point is splitting Philadelphia County into 2 separate, evenly split Districts), the Democrats would actually LOSE a Congressional Representative to the US House of Representatives. Instead of 13 Republicans and 5 Democrats, it would be 14 Republicans and 4 Democrats. Unfortunately though, I think PA’s Democrat Controlled Supreme Court, and Democrat Governor, Tom Wolf, are coordinating to Gerrymander Pennsylvania to benefit Democrats. I’m not sure where you are getting that theory. There are more democrat votes in PA than republican. If the districts were fair, we would have close to a 50/50 D/R ratio in the house. I do agree that the priority should be fair, community-based districts; not another gerrymander. We want these new districts to last, otherwise, we will just end up with another court case in a year. what happening in the 12th? but this map still looks better than the Corman/Turzai Abortion…whoops. It only “looks better” because it’s GERRYMANDERED for Democrats…….Have a nice day. 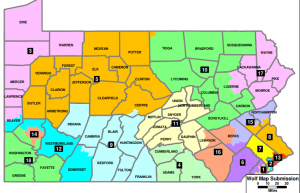 A Gerrymandered map……that favors Democrats……Don’t worry though, I’m sure that the Democrat Controlled Supreme Court of PA will toss it……..Actually, they’ll uphold it saying that it’s ok for Democrats to Gerrymander districts that benefit them. The senate Dems are crazy. You can’t do what they’re doing with Philly there when you read the Supreme Court opinion. Just throw it away. Ideally, Philadelphia County (of course, including the City itself) needs to be split up into 2 separate districts, by themselves. Of course though, the Democrats, judging by their map, have GERRYMANDERED PA by giving Philly the leverage to ensure that as many districts possible, are kept in the control of the Democrat Party. WRONG! Pennsylvania’s population is almost 12.8 million people. Divide that by 18 and you have 710,000 people per Congressional District. Philadelphia County’s population is 1,567,872 people. Divide that by 2, and wind up getting 783,936 people. That’s 2 Congressional Districts with just over 73,000 extra people for a portion of a separate Congressional District. Congressional Districts are supposed to be drawn by balancing the shaped Physical Geography, Total Population, and Population Geography of a State. 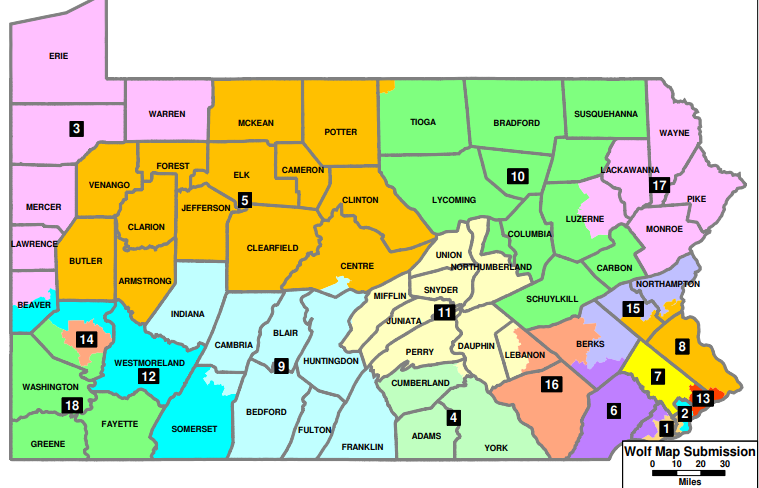 By what you’re suggesting, PA should be GERRYMANDERED to favor…..Democrats. If Philadelphia is divided into 10 Districts, that results in a GERRYMANDERED, Democrat favoring map. It’s not the fault of filthy Philadelphia that they swing so far left of the rest of PA. Philadelphia Democrat voters have geographically and politically segregated themselves from the rest of PA, AT THEIR OWN FAULT! More people want to live in Philadelphia than West F*cksberg with the racists. Philly generates more revenue for the state that helps out all the right-wing whiners. Put Philly, or South East PA into it’s own state, and the “T” would have the standard of living of a 3rd world country. They’d be shipping $2/day sweatshop jobs to the “T”. Philly is the “birthplace of liberty”. What you call “far left” is normal American respect for civil rights. You probably live in a township where the only “black people” you see are lawn jockey statues. Philadelphia is as outright Communist as any City in China, given that it is a 1-party Democrat Dictatorship, but then again, the rest of Pennsylvania’s Taxpayers fund the failing, BANKRUPT Philadelphia School System, just as NJ Taxpayers fund the failing Newark School System. I would expect nothing less from a filthy, communist loving, leftwing piece of s*** like you to spit on Pennsylvania residents who don’t vote 90% Democrat as indoctrinated sheeple like you do. You’re not geographically inclined either are you? What the hell is your point? philly has 2 CDs represented by Dems. Who will run in the new 7th under these maps? That sleazebag Leach? Montco’s Dems have a pretty deep bench so there are any number of people who could feasibly jump into that one. It would become a zoo of a primary pretty quick though. They clearly just wanted to prove that TWO can play that highly-partisan gerrymander game. What this does is give the Justices the choice of picking anything in between the two that have been submitted so far, and thereby appear impartial. The Republicans screwed themselves again, by submitting an extreme gerrymander as their opening gambit. Bend over, Turzai – the new map will have sharp edges! I almost agreed with you but then realized my mistake. Dunk right back to the Republicans. Idiot !!! This isn’t Wolf’s map. Idiot!!! Be gentle: understanding the constitution and basic civic concepts like Separation of Powers is difficult for some people. This is beyond a joke. The worthless, inept Dems complain about gerrymandering and here they create a map exactly like the 2011 enacted map – except gerrymandered to their benefit. They break up counties in Lehigh Valley and Central PA just to their benefit ignoring their past crying about munis and counties unnecessarily being broken up. What frauds. This is a mess because the corrupt union owned courts want pay back because they can’t win elections without cheating. So when Trump offers an unconscionable budget that decimates funding for popular programs, that’s just smart negotiating, but when House Democrats make a strong opening bid, that’s corrupt? It sure is tough keeping up with you folks. This is the only way andrew Lewis will become a congressman. Not even sure about that… People in Dauphin hate his guts. Character that poor leaves an awful taste in any sensible thinking individual’s mouth. You are joking right? That district would vote Perry in over Lewis any day. Breaking News: Democrats gerrymander too. Voters are shocked. But they are the “right” people and its okay, because reasons.